Microscopic asbestos fibers from friable (loose or crumbling) asbestos can be suspended in air and inhaled. Once inhaled, fibers remain in lungs, causing lung cancer. Asbestos may be found in pipe insulation and insulating boards, textured wall surfaces, electrical equipment, floor and roofing tiles and certain adhesives. If asbestos is in good condition, and fibers are not exposed, it does not need to be removed. Asbestos should be handled by a certified asbestos abatement contractor. Contact the resources listed on this page. NJDEP requires notification at least 10 business days prior to any asbestos removal activities. All asbestos containing materials must be containerized, labeled and removed in accordance with NJDEP regulations. Asbestos must be adequately wetted so that fibers will not be released, and sealed in leak-tight, properly labeled containers. If bags are used, they should be thick plastic (6 mil) and double bagged. The same handling procedures are required for contaminated clothes and equipment. Container must then be labeled with an OSHA approved asbestos warning label. Do not dust, sweep or vacuum particles suspected of containing asbestos. Asbestos is not permitted for disposal at either of the two MCMUA transfer stations with ordinary trash. Small quantities, up to 100 pounds may be delivered to the MCMUA's household hazardous waste programs. Quantities over 100 pounds will have to be managed by other facilities permitted to accept asbestos. See below for more information. Household Hazardous Waste (HHW) Program Asbestos Disposal Information - The HHW Facility is only to be used for small asbestos-removal projects. No household or business may deliver asbestos from any remediation project in which the total quantity of asbestos exceeds 100 pounds (wetted, double-bagged and sealed with duct tape). There will be no exceptions. Customers who deliver quantities in excess of 100 pounds will be redirected to the landfills listed in the right column of this page. Asbestos-containing asphalt roofing materials and vinyl asbestos floor tiles that are not broken and are removed in accordance with NJDEP regulations can be disposed of in designated solid waste landfills. J&S Environmental Laboratories, LLC 2333 Route 22 West, Union, NJ 07083, 908-206-0073. Place sample in zip-lock bag inside another bag, sample size needs to be 2" x 2". $45/sample, checks or cash. Request PLM analysis. G.R.O.W.S. 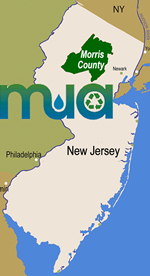 Landfill (Tullytown/Morrisville, PA area) 215-428-4390 is the general phone number for the GROWS Landfill. Accepts both friable and non-friable asbestos) Residents wishing to use the GROWS Landfill must call 267-580-2816 to complete the approval process in order for the landfill to accept the asbestos material. IESI Bethlehem Landfill, 2335 Applebutter Rd, Bethlehem, PA 18105, 610-317-3200. (will accept friable asbestos but it must be properly manifested according to PA-DER rules). www.pleuralmesothelioma.com - Comprehensive site on asbestos and mesothelioma, providing information and support to those who have been exposed to asbestos. www.mesotheliomaguide.com/ (Asbestos Page) - Mesothelioma Guide is an ally in the fight against asbestos-related cancer. www.mesotheliomalawyercenter.org - Mesothelioma Lawyer Center provides information on only top mesothelioma law firms.